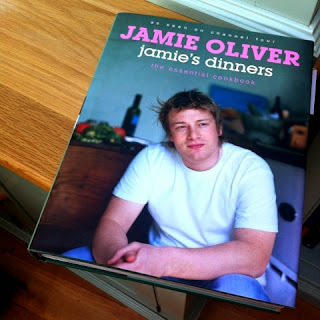 It's back to Jamie this week for a summer salad from his jamie's dinners book from 2004. It was around this time that he was involved in improving school dinners and the ethos behind the book is not about creating restaurant food but giving good quality options for families. He worked with Kidbrooke School in Greenwich which is just up the road from us. The changes made to the school dinners went some way to improve the school exam results, which just goes to show you really are what you eat. "When I signed up as a dinner lady to make school dinners at Kidbrooke school in Greenwich, I wanted to show people what rubbish their kids were getting fed at school and how little government was spending. Basically, I wanted to get rid of the junk. I had to prove that, for the same price as a bag of crisps, just 37p, I could produce a properly cooked, nutritious meal at lunchtime." You can read more about how the feed me better campaign happened here. The recipe suggests using chickpeas in jars rather than tins, as they're plumper. As chickpeas are one of my store-cupboard staples, it was tinned chickpeas for me. You start by slicing the red onion thinly along with the red chillies. Then roughly chop the tomatoes and leave them to marinate in olive oil and lemon juice. Next warm the chickpeas and add 90% of them to the tomatoes and onions. Mash the remaining 10% of the chickpeas and then add them too - mashing them gives the juices a creamier consistency - and it's definitely worth doing this, even though it sounds a bit odd. Jamie says to leave this to marinate for a while, how long depends on how long you have I guess! It does mean that you can ahead if you were having this as part of a larger feast. 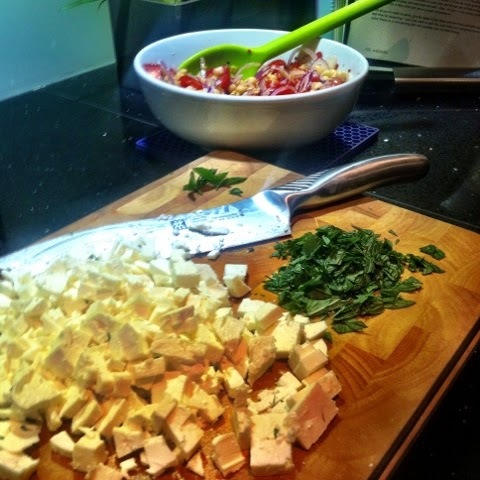 Finally when you're ready to serve add crumbled feta, chopped mint and torn basil and adjust the seasoning with some more lemon juice as well as salt and pepper. I served this as a side dish with some cold roast chicken and a green salad. We had some left too which made for a good packed lunch the next day. 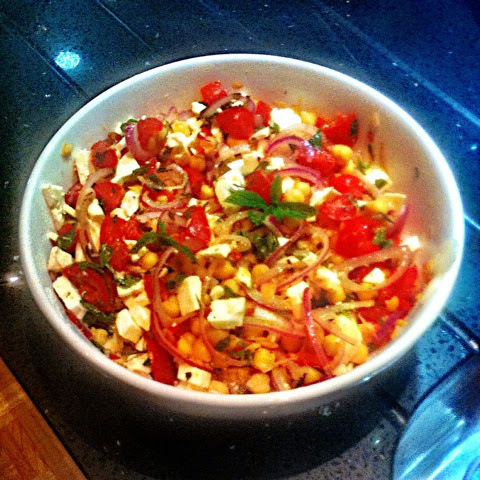 Jamie's right, we don't use chickpeas in enough ways in the UK and this salad was a great way to use them. I'd add more chilli next time - or at least check to see how hot my chilli was, the one I used was quite mild. I didn't add all the feta as it seemed a lot to have in a side dish - but I did add the feta I'd saved to lunch the next day. It would be good to do as part of a picnic or cold buffet lunch.